Activists of Dogra Front and Shiv Sena during a protest demonstration at Jammu on Tuesday. 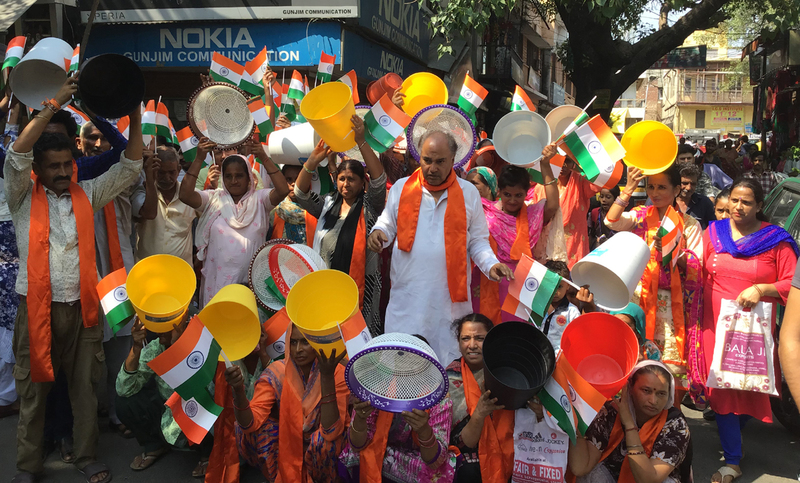 JAMMU, Sept 11: Activists of Dogra Front and Shiv Sena here today under the leadership of their president Ashok Gupta staged a protest demonstration against Food, Civil Supplies and Consumer Affairs Department (FCSCAD) for lack of ration availability and hike in sugar prices. The protestors carried empty utensils and raised slogans against FCSCAD. Speaking on the occasion Gupta said, while sugar should be sold at a subsidised rate, its price has been hiked from Rs 13.50 to Rs 25 per kg and this will affect over 45 lakh poor people in the State. He also said that in November last year prices of flour and rice were hiked by 50 per cent which resulted in hue and cry among the poor people. He further said that black marketing of the ration should be stopped so that common man can heave a sigh of relief. Those who were present in the protest included Suresh, Ashu, Usha, Sunita, Shashi, Anita, Rajni, Bhola, Pichu, Sudesh, Abhishek and others.